What is Galaxy S5 safe mode? For all Android phones, safe mode will load all the default settings and the original software/apps. Safe mode in Android devices essentially blocks all apps you installed to avoid possible problems caused by these apps. In the old Android days, some Android apps are poorly coded, so, safe mode was often used as a life saver to get rid of the poor-written apps. Nowadays, the safe mode is seldom used because of the improvement in Android apps thanks to the improved Android SDK. Safe mode also reset most of the settings temporally (for the safe mode session only). So, it can also be useful when you mess up the settings of the phone. Galaxy S5 fully supports Android safe mode. When you need safe mode in Galaxy S5? Most of the time, you need the safe mode due to some apps. A few apps may block certain functions in your phone and you get very weird behavior of the phone. You may boot your galaxy S5 into safe mode to find out the trouble-maker. In Galaxy S5, I found a very common problem faced by many Galaxy S5 owners: locked in kids mode. Most owners who are locked in kids mode will swear they entered correct PIN/alternative password, or they never set the PIN/alternative password. Of course, the problem is that they cannot exit from kids mode. A rebooting will still send you to kids mode. Google account does not help. Android device manager does not help. The simplest way to get out of kids mode is booting youor Galaxy S5 into safe mode. Step 1: Power off Galaxy S5. You can press and hold power button until you see the pop up options window as shown below. Tap Power off. Wait about 15-30 seconds, your S5 will be off. Because power button options are implemented in the hardware level, you can use it at any time and is NOT limited by the app you are using. Of course, it works in Kids mode as well. Step 2: Press and hold volume down button AND the power button. Once screen lights up, you can release power button. Please remember, you should NOT release the volume down button (the lower part of the volume rocker) . You must keep it pressed. Step 3: Continue to press and hold volume down button until you get the lock screen. Galaxy S5 should boot up and eventually boot into safe mode. Once you get the lock screen, you can release the volume down button. Step 4: unlock your Galaxy S5 and you should see the safe mode indicator in the home screen. Now, you are in safe mode, you can check whether your S5 behaves normally. You may also disable or uninstall some apps that causing the problems on your S5. 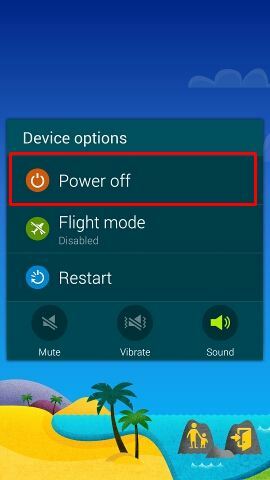 How to exit safe mode in Galaxy S5? To exit Galaxy S5 safe mode, you can just boot the S5 normally. Press and hold the power button until you see the popup option window. Choose restart or power off. You don’t touch any power buttons this time. Once the S5 finishes the rebooting, it will be in the normal mode. 1. I followed the steps, but my S5 still booted into normal mode. Very likely, you released the volume down button too early. You need keep the volume down button pressed until you reach the lock screen. In very rare cases, you can try to use volume up button instead of the volume down button if the volume down button does not bring you into safe mode. 2. My S5 is stuck in safe mode and how to get out of the safe mode? You can power off the phone, remove the battery, wait a min, put the battery back, power on the S5. Do you have any questions to boot Galaxy S5 into safe mode? Please let us know your questions or problems on booting Galaxy S5 into safe mode in the comment section below. We will try to help you. These instruction were a life saver. Well at least a phone saver! I am now out of kids mode. Thank you so much. What did you get? any error messages? What’s not working? What did you get?